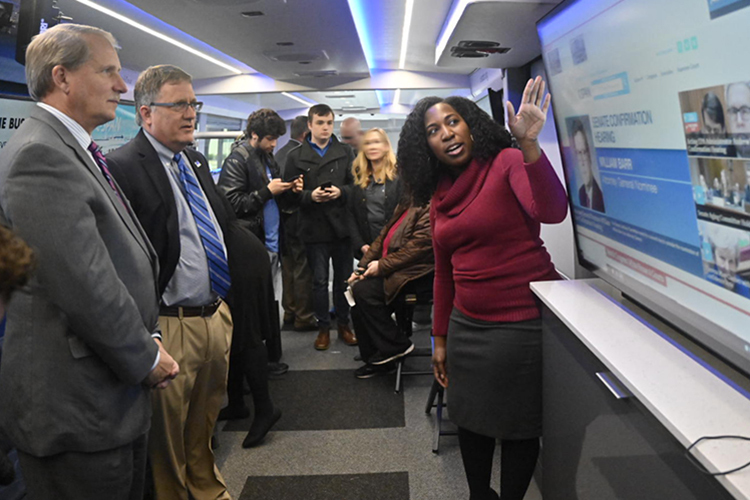 MTSU Career Center takes charg..
MTSU students and community leaders spent part of their day Jan. 16 surrounded by communication wizardry aboard the C-SPAN Bus. 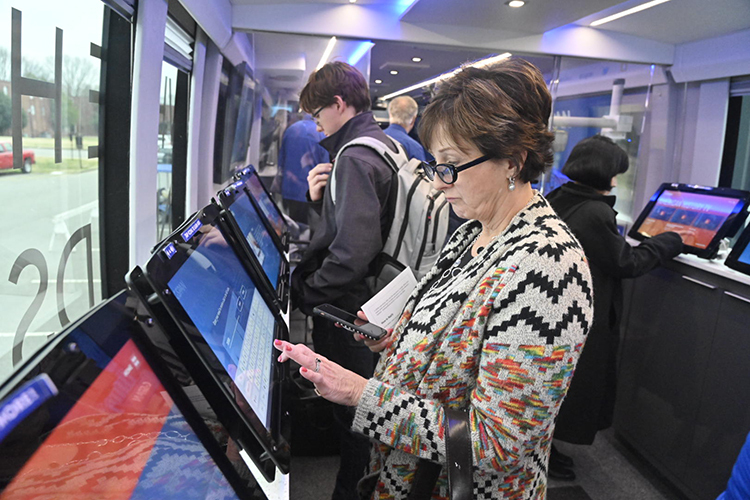 A 45-foot conveyance packed with interactive technology, the bus put visitors only a touch screen away from the more than 247,000 hours of content in the network’s video library. The Cable-Satellite Public Affairs Network, which is funded by the cable industry, has covered American government and culture since 1979. It is perhaps best known for its live gavel-to-gavel coverage of Congress. The video library dates back to 1987. 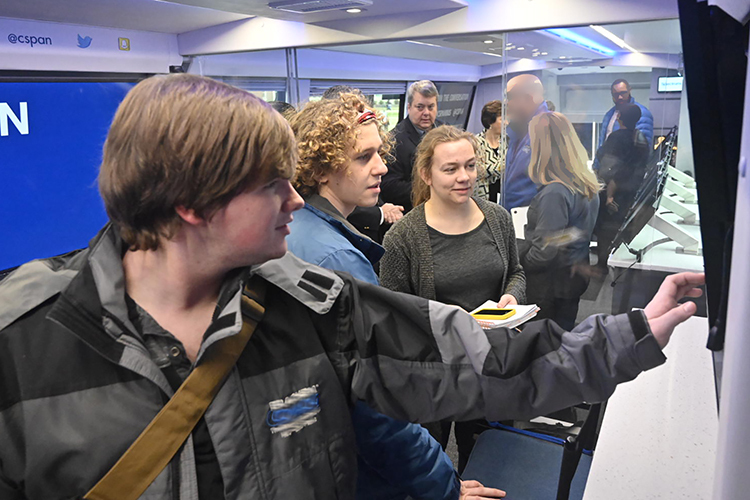 Janae Green, a C-SPAN marketing representative, and Robin Newton, a media relations specialist, served as tour guides through the bus, which is equipped with cameras, lights and master control equipment suitable for live broadcasting. The MTSU stop was part of the bus’ “Southern swing,” that took it next to Knoxville. Visitors could be videoed by C-SPAN staff for short messages explaining “what it means to be an American” in conjunction with the network’s video documentary competition. Students in grades six through 12 are competing for a $5,000 grand prize and 150 smaller prizes, and their videos will air on C-SPAN. “They’re arranging these videos from start to finish, whether it’s scheduling the interviews, doing the editing, whatever the case might be,” Green said. Among the visitors who could not resist sharing their views were Rutherford County Mayor Bill Ketron and MTSU Provost Mark Byrnes. John Cantor, a freshman from Williamsport, Maryland, said he found the bus “fascinating” and expressed interest in an internship with the network. During their visit, Green and Newton also spoke to two MTSU media classes about how budding reporters can use C-SPAN to find attributable, authentic source material for class reports and projects. Dr. Ken Blake, a professor in MTSU’s School of Journalism and Strategic Media, said he’s pleased the juniors and seniors in his Journalism 3090 course were hearing directly from C-SPAN professionals about the real-world reporting skills he teaches in his class. C-SPAN is celebrating its 40th anniversary this year. It airs live coverage of the U.S. Congress, interviews with prominent authors and in-depth coverage of other events that bring the public closer to the inner workings of their democracy. The commercial-free public service is funded by cable and satellite TV companies. In Murfreesboro, Comcast provides C-SPAN programming on channels 7 and 1128, C-SPAN2 on channels 100 and 1129 and C-SPAN3 on channels 105 and 1130. AT&T U-verse customers can watch C-SPAN locally on channel 230, C-SPAN2 on channel 231 and C-SPAN3 on channel 232. Local DirecTV subscribers can watch C-SPAN on channel 350 and C-SPAN2 on channel 351, while Murfreesboro-area Dish Network subscribers can watch C-SPAN on channel 210 and C-SPAN2 on channel 211. Both providers currently offer C-SPAN3 only via live network streaming at their websites. C-SPAN also is on the web at www.C-SPAN.org.